It is my pleasure to announce that Ken Walton has agreed to serve as the new Kanwa tho Lodge Adviser effective November 1, 2017. Mr. Walton currently serves as adviser to the Vice Chief of Chapters and as the Wikiak Sabbeleu chapter adviser. He is the past Scoutmaster and current Assistant Scoutmaster of Troop 505 in Gateway District. He served as Scoutmaster for Three Harbors Council National Jamboree Troop 2323 this summer. 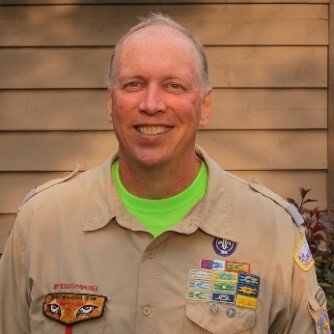 Mr. Walton is an active Scouter who, among his many Scouting adventures, has visited Philmont Scout Ranch eight times. We are grateful for the leadership of Mike Dubis as Lodge Adviser for the past two years. Mr. Dubis is taking on a new council role in 2018 as Scoutmaster for the Wood Badge training course. He has provided strong leadership to the lodge while serving as Scoutmaster of Troop 595 in Iron Horse District and as a Scoutmaster for Three Harbors Council National Jamboree Troop 2324. I'm also pleased to announce that Adam Braatz, Sr. Program Executive with Three Harbors Council, will serve as the Lodge Staff Adviser starting on November 1st. Mr. Braatz joined the council staff in May and previously served as District Executive in the Greater St. Louis Area Council. This summer, he served as camp director at Indian Mound Scout Reservation. Mr. Braatz can be reached at 414-443-2873 or Adam.Braatz@Scouting.org. Mr. Walton and Mr. Braatz will support the leadership of newly elected Kanwa tho Lodge Chief, Tyler Gerds. Please join me in congratulating all three on their new roles and thanking Mike Dubis for his dedicated service as Lodge Adviser.